6. Whisk in the thyme, nutmeg and cinnamon. Season to taste with salt and pepper. 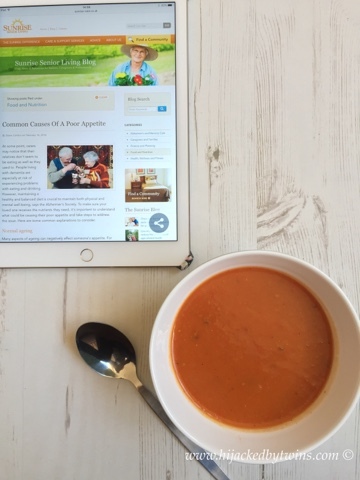 This soup is so delicious and full of flavour. It makes a perfectly, warming lunch on cold days and is even better with a chunk of warm, fresh bread! Sunrise Senior Living have homes all over the country, from Sunrise Care Homes in Eastbourne to care homes south of Manchester. All together they have a total of 27 care communities across England. Food plays an enormous part in our health and well being. I am a true believer in putting the best in to get the best physical and mental health from your body and mind. People who are in care homes need to get all of the goodness possible from their meals and it is lovely to see that homes like Sunrise Senior Living and continually updating and improving their menus. Well done on making the soup I'm not that good at making soup myself. I love butternut squash definitely one of my favourite vegetables. 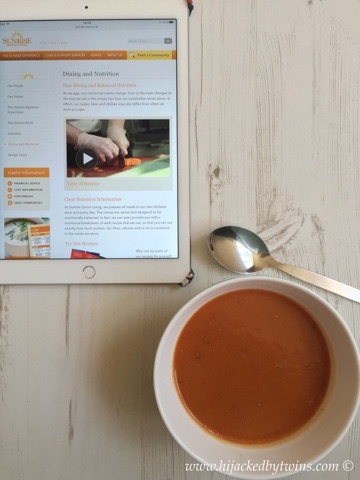 Me and my kids love Butternut squash soup. its so quick and easy to make and taste deeeelish!! I have never made it with Chesnuts though and will have to try this new one. This sounds really tasty and easy to make (even for me), I'm always eating boring sandwiches for lunch. If this is senior living I've got nice food to look forward to! I love butternut squash but I have never put it together with Chestnut before. It sounds yummy!